Also starring Rakul Preet in the lead role, Dev will have Karthi performing some high-octane action sequences in the film. Actor Karthi has couple of films up his sleeve which includes his brother Suriya’a production Kadaikutty Singam that is being directed by Pandiraj. Karthi will also be working with newcomer Rajat Ravi Shankar for a film which is rumoured to be titled Dev. 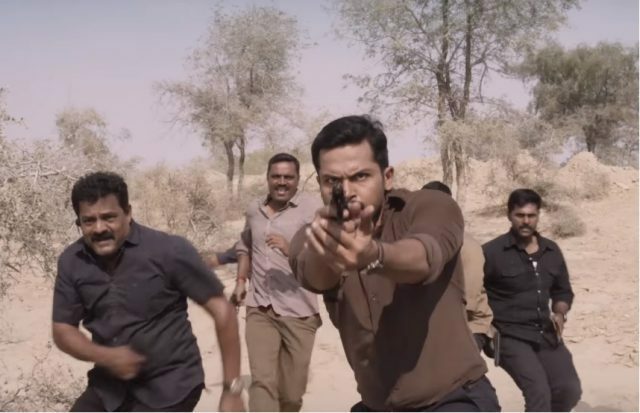 Also starring Rakul Preet in the lead role, Dev will have Karthi performing some high-octane action sequences in the film. The makers will head to Hyderabad to shoot these action sequences which will involve Karthi. The makers recently wrapped up a schedule in Chennai which involved lead actors Karthi and Rakul Preet. Post the action schedule in Hyderabad, the team is said to be heading to Mumbai and to US from there for further schedules. Being produced by Lakshman Kumar, the film also stars Ramya Krishnan, Prakash Raj, Renuka and Karthik Muthuraman in pivotal roles. The makers may look to release Dev in Telugu as well since Karthi has a good following in the Telugu states. Karthi is currently gearing up for his next Kadai Kutty Singam which is being directed by Pandiraj. Kadai Kutty Singam is being produced by Karthi’s brother Suriya under the banner 2D Entertainments and is likely to hit screens this July. Kadai Kutty Singam also stars Sayyeshaa as the female lead actor. Karthi would be seen playing a farmer in Kadai Kutty Singam and the actor has even practiced farming before shooting for it to get a hang of the character. Rakul Preet, on the other hand, is juggling between her Bollywood and Tamil films. Rakul is shooting for her upcoming film with Suriya NGK which is being directed by Selvaraghavan. Rakul has also been shooting for her Bollywood film with Ajay Devgn which is yet to be titled. It is also being reported that Rakul may be roped in to play the female lead actor in Telugu multi-starrer with Venkatesh and Naga Chaitanya in the lead role.